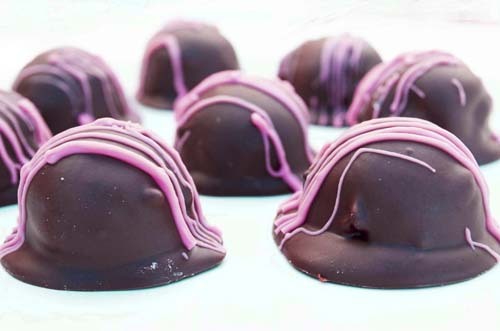 This Valentine's Day Oreo Truffles recipe is from high-schooler and aspiring chef Ashley Gelo. These easy Valentine's Day Oreo Truffles are dressed up with pink drizzled white chocolate and perfect for sharing with your Valentine. Crush Oreos in a Ziploc bag and set aside. Beat cream cheese in food processor until slightly fluffy. Add half of crushed Oreos and mix into cream cheese. Add remaining Oreos and blend into a thick, smooth paste. Roll into 1-inch balls and refrigerate for 15 minutes more. Melt almond bark, cut into small pieces and melt over boiling water in a glass Pyrex bowl. Dip truffles into alond bark and place on waxed paper-lined cookie sheet to dry. Decorate with pink-tinted white almond bark. When Ashley's not in high school, she shares her love of baking with friends and family. Ashley is an aspiring chef whose passion is teaching her friends to bake and create in the kitchen. She even organizes neighborhood cooking classes for her friends. Now she brings her latest recipes to ChefMom readers.